Home > Live Jazz Shows > Bungalow Jazz Shows Return this Friday with Bryan Olsheski & more..
Bungalow Jazz Shows Return this Friday with Bryan Olsheski & more.. The Bungalow Jazz shows have returned at Becky Ogden’s 5th avenue jazz bungalow. Join Becky this Friday, June 10th at 7:30pm for another amazing line-up of local live jazz talent with saxophonist Bryan Olsheski, pianist Bobby Floyd, Derek DiCenzo on bass, and James Gaiters on drums. These are some of the top jazz performers in the city in the comforts of the Jazz Bungalow. This is a show not to be missed. In High School Bryan Olsheski was selected as a featured soloist with State Jazz and Orchestra ensembles. Having received the Louis Armstrong Outstanding High School Soloist Award and a scholarship to attend the Jamey Aebersold Summer Jazz Workshop, the saxophonist knew his purpose. After graduating in 1995 from the University of Cincinnati College-Conservatory of Music with a Bachelors in Jazz Performance, Bryan “cut his teeth” in the industry as a soloist and guest artist with performers from around the world whilst working for Princess and Royal Caribbean Cruise lines for 2 years. 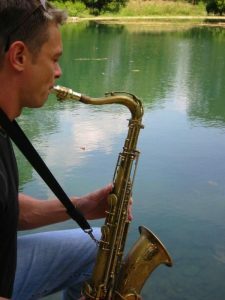 Relocating to London, England for 3 years, Olsheski soon gained a reputation as a teacher and also began performing and recording in salsa, jazz as well as function bands hired out for weddings and other special events. It is also here where Bryan formed his own band playing his original music at many of the popular jazz clubs in London such as The 606 Jazz Club, The Jazz Café and Bulls Head Barnes. He has shared the stage with some of the most famous names in jazz such as Joe Henderson, Kenny Garrett, Wess “Warmdaddy” Anderson, Conrad Herwig, Jack McDuff, Slide Hampton and George Benson. He has also been a featured soloist for The Temptations, The Columbus Jazz Orchestra, Steve Winwood, Vaughn Wiester’s Famous Jazz Orchestra, Afro-Rican Jazz Ensemble, Kico Cowan and Expresion Cubana, The Four Tops and The Spinners. Living in Columbus, Ohio for the past several years has enabled Bryan to dedicate himself more to composing and perfecting his craft. In March of 2005 he recorded his first CD under his own name showcasing several of his own compositions. The CD features Bobby Floyd on the B3 Organ, Derek DiCenzo on Guitar and Reggie Jackson on Drums.